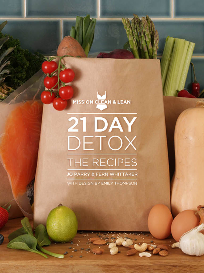 Mission Clean & Lean is a unique detox programme open to new members worldwide. Our philosophy is clean eating and daily workouts to empower, invigorate and transform body and mind. This is the indispensable guide to our 21 Day Detox plan and all the recipes are sugar, wheat, gluten and dairy free. However try our clean eating philosophy for three weeks and you won't want to stop there, after realising how good it makes you feel we hope you'll want to practise this holistic approach to eating for the rest of your life. Finding pleasurable ways to incorporate healthy food into your life for the long term is what Mission Clean & Lean is all about.